Quinnipiac head coach Rand Pecknold is looking forward to hitting the reset button on what was an atypical regular season for his Bobcats in 2017-18. 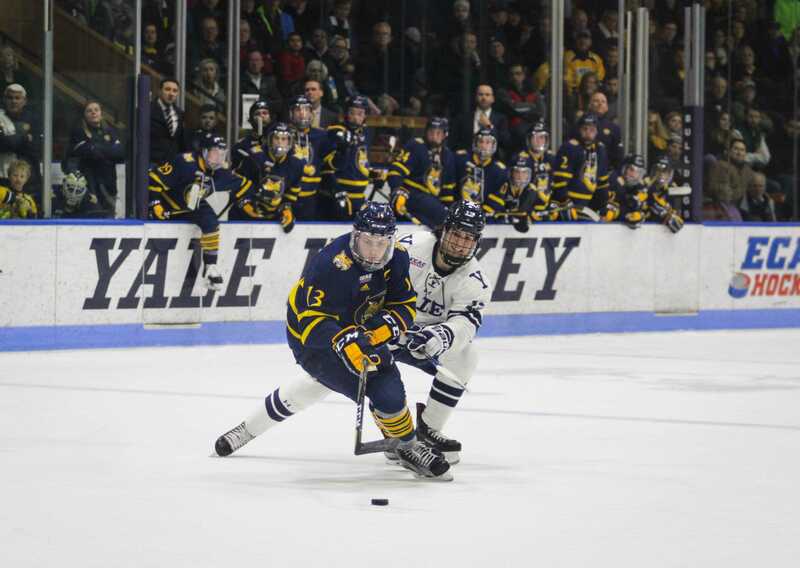 Despite carrying a sub-.500 record into March for the first time in Division I program history, Pecknold isn’t worried about potentially ending the season with his first losing record at Quinnipiac. Following a weekend split in North Country that gave Quinnipiac the No. 9 seed in ECAC Hockey, freshman forward and leading point-scorer Odeen Tufto reiterated the importance of putting the team’s 14-16-4 record in the rearview mirror as the group is tunnel-visioned on the postseason. For the first time 2005-06 (in which they swept No. 7 seed RPI) the Bobcats are on the road for the ECAC Hockey Tournament First Round. Luckily for Quinnipiac, it only has to travel 10 miles south to rival Yale for the opening round of playoffs. 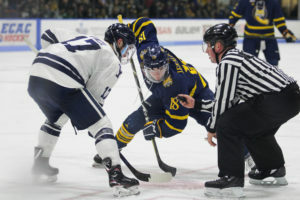 And while the team had overwhelming success against the Bulldogs following the 2013 National Championship, Quinnipiac’s most recent game against its cross-town rival resulted in a loss in New Haven. Combined with the parity of both teams posses and the electric atmosphere from the packed crowd, the game had a true rivalry-feel to it. Add the pace of playoff hockey to that mix and this series is bound to be exciting. There is added motivation to redeem themselves in this series as well, in part due — depending on who you talk to — to the Bobcats hitting around six to eight posts in a 3-2 loss last time these two teams met. 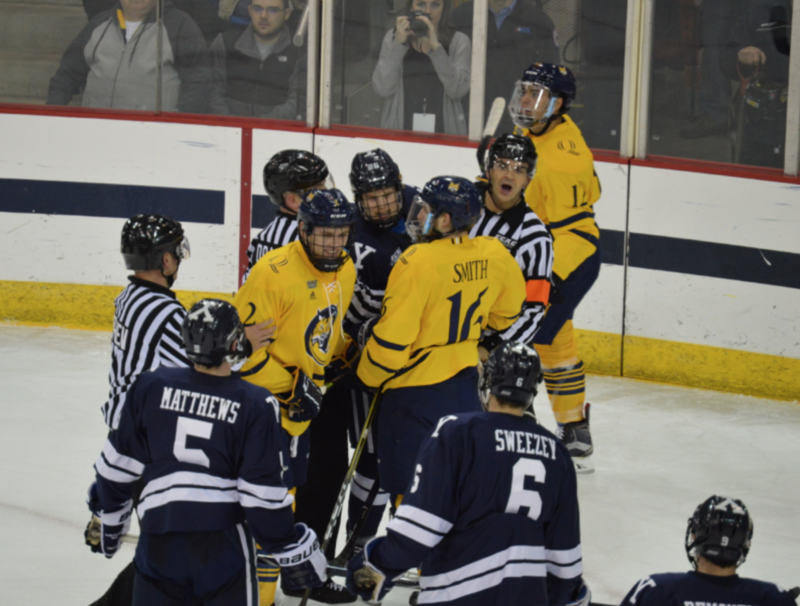 Defensively, the Bobcats look to contain two talented forwards in particular: junior Joe Snively, who Pecknold called one of the best players in the country and senior captain Ryan Hitchcock. While Hitchcock sits with 19 points in 29 games, good for second on the team, Snively leads the team with 36 points in 29 games. With both forwards, and sophomore forward Evan Smith (third in team scoring with 17 points in 29 games), all playing on separate lines, Quinnipiac’s depth at forward will surely be challenged this series as well, especially with last change as the away team. If the Bobcats are indeed successful in the series, they will advance to the quarterfinals, in which they would likely play No. 1 seed Cornell, pending there are no other upsets in the first round. But there is little margin for error. 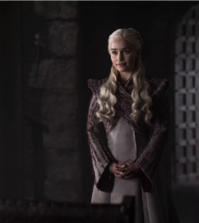 With two losses, the season is over.